The mission of the Kansas Sampler Foundation is to preserve and sustain rural culture by educating Kansans about Kansas and by networking and supporting rural communities. As the official web site of the Kansas Department of Commerce, Travel & Tourism Division, this site offers travelers the opportunity to plan vacation and leisure travel trips, including lodging, attractions, and events throughout Kansas. 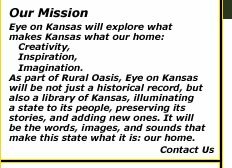 This website is operated by the Tourism Arts Alliance of Kansas (TAAK) with the goal of promoting and enhancing arts tourism in Kansas. It features databases of both artists and events from across Kansas. If you have a site that targets Kansans (especially our rural communities), let us know and we'll add you to the list!